25th International Geophysical Conference and Exhibition | Geoconferences (WA) Inc. I would like to thank Geoconferences (WA) Inc. for awarding me the JH Lord Travel Grant to contribute towards my attendance of the August 2016 ‘Interpreting the Past, Discovering the Future’ conference in Adelaide, Australia. It was organised by a combination of the Australian Society of Exploration Geophysicists (ASEG), the Petroleum Exploration Society of Australia (PESA) and Australian Institute of Geoscientists (AIG). Attending the conference was important to broaden my knowledge of the disciplines of remote sensing and potential field geophysics. Being able to attend the workshop ‘Magnetotellurics from terrane to camp scale, insights and case studies’ allowed me to learn the complexity of this technique, while being part of an active discussion on the remaining issues and latest work results. My poster entitled ‘Using remote sensing and potential field data to interpret basin fill compositional variations and structures’ was given in the minerals theme session. 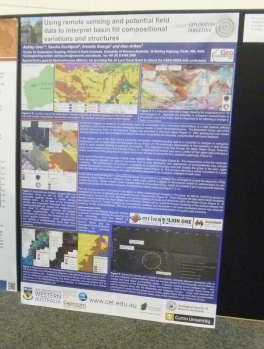 The intention of the poster was to highlight the datasets that had been most useful in describing the different sedimentary units and associated structures that are part of or underlying the Bresnahan Group, situated in the Capricorn Orogen, Western Australia. Discussion with conference attendees was useful in focusing my mind on the next phase of my PhD, as well as beneficial to describe my work to a wide audience. Finally, being able to attend networking events with other students and delegates allowed me to expand my network that would no doubt be useful into the future.